When JIRPers go out on the glacier, they always bring the "ten essentials." These items are mandatory to have with you every time you leave camp to explore the icefield. By the end of the first week, all JIRP students have the essential items ingrained into their minds. 1. Navigation - A map and compass. 2. Sun protection - Glacier glasses, to protect against snow blindness, and sunscreen, preferably with zinc, to prevent against scorching sunburns. 3. Insulation – Extra clothing. Weather changes quickly and what starts as a warm day can quickly turn frigid. 4. Illumination – A headlamp… even though Alaska is the land of the midnight sun. 5. First aid supplies – Blisters are your worst enemy on the icefield and moleskin will save the day. 6. Fire – A lighter. 7. Repair kit – A roll of duct tape can go a long way. 8. Nutrition – Trail lunch with ample amounts of GORP (fancy trail mix) is a must. 9. Hydration – One liter of water is never enough, though you can add snow to make it last. 10. Emergency shelter – A tarp, which can be used as an emergency bivouac shelter. While we all bring these same items out into the field, everyone tends to have one extra item that they personally would never leave camp without. I asked JIRPers around camp, "What is your eleventh essential?" While digging mass balance pits, Zak likes to crank up the tunes on his speaker. When he goes out to collect isotope sample, Brad brings an extra thermos of hot coffee for those necessary boosts of energy throughout the day. Scott never leaves camp without a camera. He loves to capture the candid moments of days out on the field. 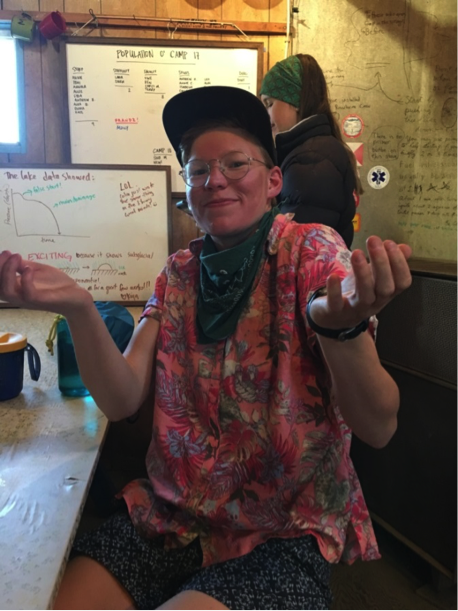 Nadia runs cold, so she doesn’t leave camp without a few extra layers for those chilly days studying isotopes on the icefield. On long ski days to mass balance pits, Clem wears a buff over his neck as extra sun and wind protection. “I never hike in my ski boots," said Marisa. She brings a pair of sneakers with her every time she leaves camp to avoid the pains of walking down a steep hill in stiff telemark boots. Although you’re never leave camp alone, Eric likes to bring friends to laugh with. Alec brings a pack of cards with him out on the icefield, because he enjoys playing and you never know when you might have time to kill. Isabelle brings a puffy skirt with her to stay warm and look good out on the ice. When Andrew goes out for a ten hour day on the glacier, he always had a stick of chapstick with him to protect against burnt lips. As the student artist in residence, June carries a small sketch book for scribbled notes and quick contour drawings. While making applesauce biscuits on my first cook shift at Camp 18, I discovered that the oven door was missing its handle. It seemed to have fallen off in a previous season. A loose screw protruding from the door provided a temporary means of entry for the biscuits, but the oven required a more permanent fix. After breakfast, I gathered some tools and materials from the generator shed and cookshack: a phillips head screw driver, a pair of pliers, a wire cutter, a length or steel wire, a roll of duct tape, and scraps from a cardboard box. Fifteen minutes later, the oven door was screwed back on, sporting a satisfyingly functional handle. Things on JIRP break all the time. The harsh icefield environment and heavy use by dozens of expedition members causes significant wear on items every season. Equipment like ski bindings and poles are particularly susceptible to sudden failure, but larger things like ovens, snow machines, and even buildings, fall apart from time to time. In a remote field camp with limited supplies, finding a simple yet effective fix for these failures is crucial but not easy. When the ideal tools or materials aren’t available, a little creativity and make-shifting is required to restore functionality, if not aesthetic appeal. We call this 'fuggering,' a riff off the name of our larger organization, FGER, the Foundation for Glacier and Environmental Research. Looking around the JIRP camps, the fuggering of past expeditions is evident everywhere. Bunkhouse shelves made from wooden gasoline crates adorn sleeping quarters in Camp 10; rearview mirrors borrowed from old cars are repurposed for the Camp 18 bathrooms. These fuggerized additions make the most out of icefield scraps, and lend a uniquely quaint vibe to the JIRP camps. Every summer on one day of the traverse, everyone makes something. On July 25th, we celebrate JIPRmas with a ‘secret snowflake’ gift swap. Student and staff gift each other wonderfully fuggered creations made from scrap material found around camp. JIRPmas, a highly anticipated event on the icefield, is a great opportunity to embrace the creative spirit of the summer. This JIRPmas, I carved a wooden dagger from a piece of firewood, replete with a duct tape sheath. Student Cullen Meurer used an empty tin can and some pebbles to make a ‘rain-maker' for his gift. A particularly ambitious past JIRPers built a meticulous cardboard replica of the Camp 10 outhouse, 'Petunia,' which still lives here. Across the years, JIRPers have built some wonderfully functional and creative things. Some of these efforts endure season after season, while others simply bring a smile to their JIRPmas recipients. But all of these creations add to the creative and resourceful spirit of the expedition. This quote is a JIRP mantra, and it comes in handy while living on a remote nunatak for two months with fifty scientists. It drives us to improvise to reach our goals. 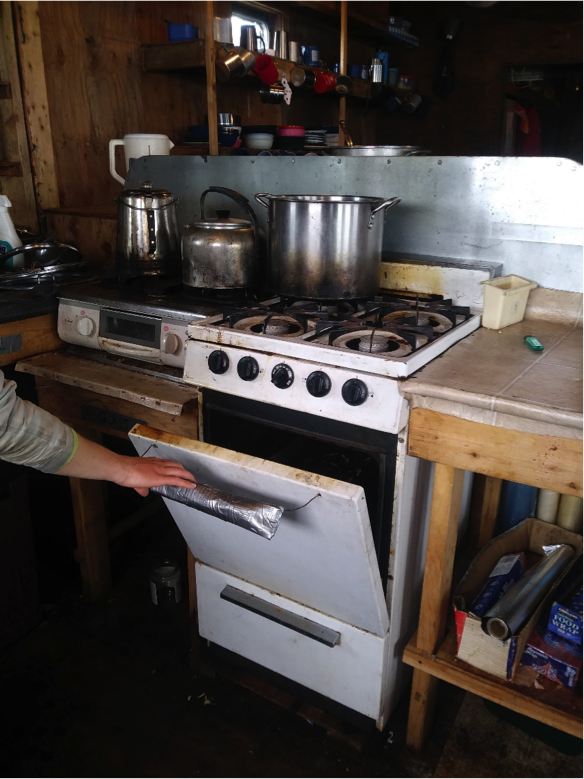 Looking around camp, it doesn’t take long to see such improvisations, which we affectionately describe as ‘’JIRP-y.’’ The benches and counters are made of wooden skis; parachute-cord becomes clothes lines; rocks are seats; and used cans are mugs for students who've forgotten theirs. Cooking on the icefield is no exception to this improvisation. We have a set inventory of food in each helicopter load with which the cooks can play. Between meals, we snack on pilot bread- round, hard crackers- topped with peanut butter and jelly. To spice up our diet, sometimes JIRPers have to get creative with our limited resources. A helicopter bringing in a fresh load of food to help the cooks with their improvisation. At Camp 17, myself and a staffer, Allie Strel, decided to put a dream into action: to make hand churned ice cream. Molly Peek, Lead Logistician based in Juneau, had hiked in for a quick visit, hauling with her a gallon of heavy whipping cream in her pack. Allie and I set our sights on vanilla chai flavoring. Each camp is home to a mix of antique machinery, objects and parts, legacies of JIRP's many years of programming. During staff training, Allie had discovered two ice cream makers at C17—one with a broken crank and one with a broken barrel. We took the good crank, and the good barrel, and got to work. Step 1: Scrub the rust from the inner barrel with vinegar and vigor. Step 2: Reinforce the outer wooden barrel with metal wire for structural integrity. Step 3: Affix the currently mismatched crank and barrel together, with a power tool to cut notches in the wooden barrel. Step 4: Grease the crank with WD40 for smooth churning. Step 5: Guess the rock salt to snow ratio for the slurry that goes in between the inner and outer barrel. Step 6: Insert ingredients into inner barrel, and churn! Author Carly Onnink and Grace Stephenson finish cranking the ice cream maker as excited JIRPers cue for ice cream. Photo by Hannah P Mode. Like any true scientific experiment, we did not succeed first time. I had to explain to many JIRPers that the promised ice cream simply hadn't churned—yet. Ally and I brainstormed possible variables and ways to set up our next trial. We decided to add more rock salt. A lot more rock salt. We took turns churning, and as we did, asked each other, "Should it be creamy yet? Should we add more salt? Is this the right churning rate?" After half an hour, the creamy mixture was getting harder and harder to cranker. A third person needed to hold the lid down while we cranked, and then the ice cream was oozing out of the container. Carly Onnink celebrates a successful batch of ice cream on the icefield. Photo by Hannah P Mode. Everywhere you look on the walls of JIRP Camps, you can piece together a history of the expedition and its participants through scribbles and graffiti. In the outhouse at Camp 17, an anonymous JIRPer asked the above question - "What would you do for a Klondike bar?" “Jump in Lake Linda,” someone wrote in reply. Lake Linda is an ice-dammed lake at the southern end of Lemon Creek Glacier, which itself flows from south to north. It is visible from Camp 17 and from the outhouse window. It seems counter-intuitive to have a liquid lake this far from the terminus of the glacier, but it is all due to the slope of the ice. A profile view of Lemon Creek Glacier, showing the high point roughly 1 km from the lake, and the direction of water flow in the glacier. The highest point on the Lemon Creek Glacier is not at its top. Instead, the glacier rises from its southern end before gently falling to the terminus. On a glacier, water flows in the direction of the ice surface, regardless of the glacier's underlying rocks or where the water is located within the glacier. The water that accumulates between the start of the Lemon Creek and the ice's highest point, about 1 km further down the glacier, therefore, pools into Lake Linda. This means that water is actually forced uphill at the base of the Lemon Creek into the lake, because the ice surface flows to Lake Linda even though the underlying topography does not. When JIRPers arrive at C17 in mid-June and after a period of rain, the lake is usually full, at about 200m in diameter. The conversation in the outhouse continued. In response to "Jump in Lake Linda," someone else had written: "But it's gone." It's true - Lake Linda empties every summer, and if JIRPers are lucky, they witness this phenomenon. This year, we observed the lake drop dramatically over five days. We know for certain that the lake doesn’t solely disappear by evaporation, which means it must have a drainage. But where is the drainage? And where does the water go once it drains? Glacial lakes like Linda offer scientists the opportunity to learn more about how water flows through a glacier. This year, Dr. Kiya Riverman, returning faculty and member of JIRP's academic council, and Dr. Colin Meyer, both from the University of Oregon, joined us at C17. One of their first tasks at camp was to place a pressure sensor at the lake's bottom. Previous studies on similar lakes show a variety of ways that they can drain, and Linda is a mystery they would like to solve. Pressure sensors can be as cheap as twenty dollars, and provide an accurate measurement of depth. This cheap tool gives us insight into the nature of lake drainage. Rivermen and Meyer's theory is that some kind of siphon is created when a channel in the glacier opens up. Much like a fuel siphon, this means that as long as the outlet of the channel is at a lower elevation than the start, then water will flow out the drainage, regardless of if it must go uphill. The data they retrieved seems to back up this initial hypothesis and goes some way to explaining the mystery of this lake. The rate of drainage increased over the four days that the sensor was in place, which suggests that the area of the channel that drains the lake also increases over time. "Don't worry, it'll be back," is the last addition to the outhouse wall conversation. As predictably as it drains, Lake Linda will fill again for another cohort of JIRP students to observe and inquire about. But what we have shown in just a few days with a cheap sensor, is that a testable hypothesis can go a long way in answering a scientific question. I’ll have my Klondike bar now. Outhouse ponderings- graffiti on the wall of the ‘double-wide’ outhouse, Camp 17. There’s little that can prepare you for life at Camp 17. The days here are tinted with transition, as we adjust to the weather, the chores, the nonstop outdoor activities, and living with each other. Surviving and thriving in this unfamiliar environment is a fine art, so I asked both seasoned and new JIRPers, "What is your best piece of advice for thriving at Camp 17?" Hello from Juneau! 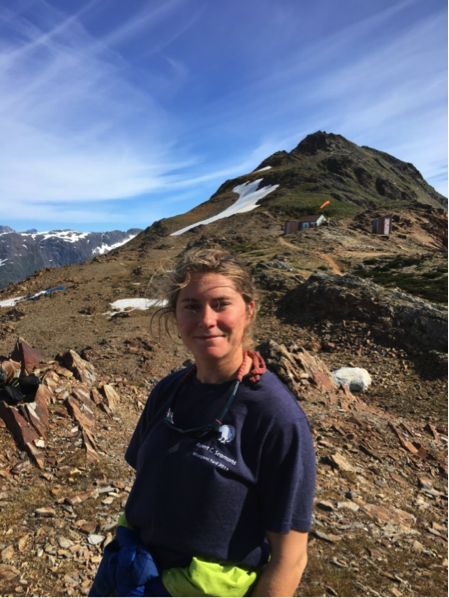 This is Molly Peek, Lead Logistician for this field season, checking in from the JIRP headquarters at the Eagle Valley Center (EVC) in Juneau. It is the 4th day of Staff Week and the JIRP staff are hard at work at the EVC setting up for the summer, doing Wilderness Advanced First Aid (WAFA) training, planning helicopter trips, and getting ready to welcome our students in 12 short days! The 2018 Field Season is shaping up to be a wonderful one, already saturated in Alaska magic: despite an original forecast of 10 days of pouring rain, we have already had four days of sunshine (with only a little bit of that Southeast Alaska fog and rain)! After long days of first aid training, the staff have enjoyed beautiful walks through the woods to see whales and eagles at the beach. Dixie, the dog of our Program Manager Annie, has also benefited, getting plenty of sticks thrown for her and a few cold swims in the ocean. Staffers Allie Strel, Alex Burkhart, Kate Bollen, and Nigel Krumdieck enjoy some goofiness at Eagle Beach after a post-dinner sunset walk. As the field staff learn about wilderness first aid and prepare to hike up to Camp 17 for glacier safety training, Annie and I are busy setting up the Juneau office for the summer. Coordinating student gear rentals, organizing faculty research schedules, and planning summer helicopter flights are high on our to-do lists this week. We are also enjoying overhearing WAFA instructor Steve educate the field staff and share some of his best stories of backcountry medicine. While life during Staff Week can be quite different from routines in the heat of the field season, we are still enjoying some of the best parts of the JIRP lifestyle. Staff dinners have been delicious, with homemade ice cream from frozen dessert enthusiasts Allie Strel and Alex Burkhart (future JIRPers: we can’t promise this kind of deluxe food on the icefield, but I can assure you that the passion for food will be the same). We are looking forward to the arrival of students and faculty next week to officially kick off the 2018 field season! Keep checking the blog, as well as Facebook and Instagram (@JuneauIcefieldResearchProgram) for updates throughout the summer!